Grant Corner: Developing a Community of Writers! Writer's Corner is a blog about teaching writing with passion written by a 43 year veteran teacher. Teaching units from the Writer's Corner Store in teacherspayteachers.com are highlighted. Advice on what has worked in my classroom is given. Developing a Community of Writers! The first day of the new school year is your first chance to begin building a community of writers in your classroom. Since I teach in "chunks" there are three activities that I share with the students - video clip discussion, poetry writing, and writing fluency instruction. I like to use short video clips from you tube for discussion, and Robin William's brilliant acting as an English teacher at a private school is my choice for the first day. The first clip is "Carpe Diem - Cease The Day" (2:59). Our hallways at school hold graduation pictures from the class of 1964 onward which include some of the students' parents and grandparents. My graduation picture hangs there as well. We talk about the community of our school's past and present. A second clip illustrates how students must use their imagination and creativity to become writers in spite of themselves. In "Writing With Imagination and Creativity" (2:46) Williams helps Todd to create a poem on the spot which is what I am about to ask my sophomores to do with "Where I'm From". Todd has not done the homework assignment because thinks he is not capable of writing a poem, yet Williams proves him wrong. I am hoping my new students will "get" the message presented that all students can write if they believe in themselves. Why do we read and write poetry? (1:31) Both Robin's performance in Dead Poet's Society and the popular i-pad commercial (1:30) take my breath away every time I watch them. Poetry has gotten a bad rep with many of the students and I intend to instill my passion for it during this year. Students have already heard, "You'll do a lot of writing in English 10" and these clips validate that in the first fifteen minutes. The popular i-Pad commercial uses the majesty of nature and life to illustrate Robin William's rendering of the poem. Throughout the year students will ask themselves what their contributions will be during our journey. I want them to realize that poetry is not just something that dead white men have written, but embrace both modern poetry and learn to love writing it themselves. Next, I give them an example of "Where I'm From", written by Kentucky's Poet Laureate George Ella Lyon and published on her website. Immediately, there are the anticipated high school student responses. The writers in the class are excited. Students who have had older siblings in my class know this is going to be expected because their older brothers and sisters have come home with this first day assignment. Some students are convinced that they can never write poetry and don't want to share information about themselves with the other students in the class. I ask them to please give poetry a chance and share with them my own "Where I'm From" poem. (description of the natural item). and (quote of something else you were told as a child). The (another detail of another family member). and several more lines indicating their worth. White and tall, squeaking as it slowly rocks. Ignite the southern Indiana countryside. From Glenn E. and Catherine. Who attended church every Sunday. And singing in the church choir. I spent summer days trying to learn to play. And carving my own niche in memory. The second day of class we have Author's Chair and students read their "Where I'm From" poem. Author's Chair is always voluntary, but most of the students will share. We talk about the lines they like the best and students use a yellow highlighter to choose two lines of their poem for the large group poem, "Where We're From". I ask for a couple of volunteers from each class period to type the highlighted yellow lines from the individual poems into the group poem. Later in the week, they all receive a copy of the group poem and all group poems are posted on a classroom wall where they remain all year. Thus, my community building has moved from individual poems to a collective poem written by all class members. The students are excited about their poems and the writers community is starting to take shape. We are from fresh cut grass, the Hickory tree, Walnut tree and Lilac bushes. From sleeping in and making plans last minute. From barbecued chicken and hamburger steaks. The sermons preached and homemade turtle soup. Enough room for a couple more. In addition to the poetry writing, the class also writes the first of many quickwrites to improve their writing fluency. Like many of you, my state requires a fifty-five minute timed essay as one part of the graduation test which they take as sophomores. 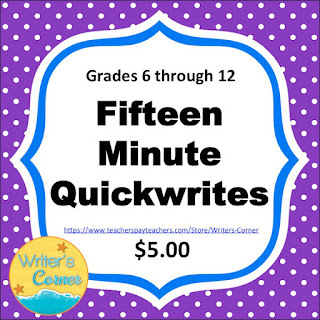 At the beginning of the year, many of the students need to greatly increase their writing fluency to be able to complete this task in May. One of my favorite first day topics is, "Explain three reasons why I should be impressed by you." I will get serious nerdy responses and flippant funny statements, but they are all expressing and communicating and letting their individual voices be heard. On the first day of class, I give them a list of writing topics that they may choose to use when we do fifteen minute quickwrites in class. The topics are part of the "Writing Fluency: Fifteen Minute Quickwrites" unit that is the most popular seller in my store. As weeks pass, I increase the Quickwrites to 20 minutes, then 25, then 30. In December, when they take the first semester final one day is dedicated to the 55 minute essay which indicates to me who will be able to pass the test in May and who still needs to work on writing fluency. Second semester begins with the 30 minute timed writing and continues to the 55 minute essays that compare and contrast to hone their best writing skills. I learn more about the students through quickwrites than I ever would in class because they write about what is really bothering them. They also share what is making them happy, although this month's boyfriend/girlfriend may be the subject of next month's broken heart poems. I write smiley faces or frowney faces in the margin, let them know that I love Taylor Swift's latest song as much as they do, suggest a restaurant in the area I've tried that specializes in food they express an interest in. It's really a tough call for me to judge whether I bond with them more over quickwrites or poems. As I read through the quickwrites after the first day has ended, I take time to write, "We're going to have a great year" on each student's paper which plants the seed that failure in English 10 is not an option and they will write that 55 minute essay to earn the right to a diploma in two years. Believe they can, and they will. I love the idea of a scaffolded poem!